Outdoor living space provides an oasis to enjoy life. Your outdoor design should include both hardscape and softscape elements to make it a comfortable place. The difference between the two is quite simple. Hardscape elements are non-living things such as pavers, rocks, concrete, fences, gates, fountains, and more. Softscape elements are living things such as grasses, flowers, groundcovers, shrubs, and trees. You need to consider the following differences between the two when designing your outdoor spaces. Installers of stone pavers in Alpharetta will remind you that hardscape installation is generally a long-term decision. When you install a sidewalk, stone path or patio, you want it to be something you’re comfortable living with for a while. The cost and labor make it something you don’t want to switch out frequently. Good long-term planning is wise. You enjoy the flexibility to change the look of your softscaped areas by replacing plants with different species. Grasses, flowers, groundcovers, and even shrubs are easy to replace. With softscaping, you can experiment with different looks from year to year. As your preferences change over time, you can try different landscaping designs. The one exception to this observation is with trees. You can obviously replace trees anytime; but to get the most enjoyment from them, you want to make a longer commitment to letting them grow. Living plants need care. You’ll need to plan for watering, fertilizing, trimming and weeding. Some gardeners love doing all these tasks. Other people don’t enjoy it so much. If you’re less interested in the care of plants, rely on lower maintenance varieties that need less watering, trimming and other types of care. Many types of hardscape, such as patios and paths, create space that tells people where to gather or walk. It’s the area where people will mingle for get-togethers or walk to reach focal points in your yard. 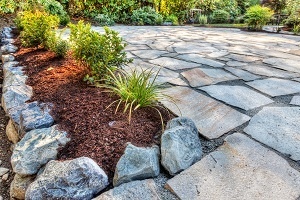 Because of that, hardscapes need to be welcoming in design. Hardscapes alone create a cold and sterile environment. They need to be balanced with the softening touch of plants. Plants add color, texture and fragrance that create a relaxing and inviting mood. When landscaping your yard, you should consider both hardscape and softscape. To get some ideas, you might consult with professionals offering stone landscaping in Alpharetta. Once you design hardscape features, it’s easy to add plantings that complement it.